This entry was posted in Politics and tagged Donald Trump by Daedalus Lex. Bookmark the permalink. I agree with you for the most part, but your comparison is not exactly apt per my thesis. Rates steadily rose from 1990 to 2008, then leveled out and slowly dropped over the past ten years. 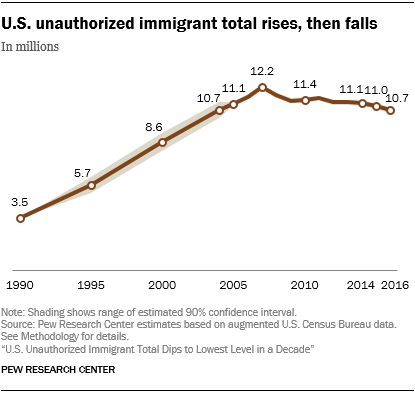 I say that a point-to-point comparison to 1990 (or some other earlier year) isn’t apt, because the point is that if the trend line has been level or dropping for the past 10 years, we don’t have an immigration crisis. Where the data point was in 1990 or 1980 or 1970 does not impact this thesis. I agree with you on how the viewpoints vary. Wake up….Walls work. They should be “part” of a system to prevent illegal immigration. Borders,language and culture make a nation. If your house was robbed once a month in 2017 and only once every other month in 2019 does that mean you can leave your door unlocked? Wake up…. Walls are a important PART of a secure border. No, I wouldn’t leave it unlocked with so native-born people around here (who in the aggregate commit crimes at a higher rate than illegal immigrants). * But if they were coming in once or twice a month to work hard and help me fix up the house, I’d probably just give them a key. Needs to be thought about! I understand… You would let them have a key after they were vetted by you. I am also in favor of immigration after proper vetting.